This week, we’re once again looking at major advertising channels I’ve used in promotion of my webserial “From Winter’s Ashes“, and analyzing them one by one for the ROI and needs of an author and publisher. Today’s focus is one of a kind, with 316 million active users, Twitter! The first thing out of the gate that I REALLY liked about advertising with Twitter was the very comprehensible targeting. 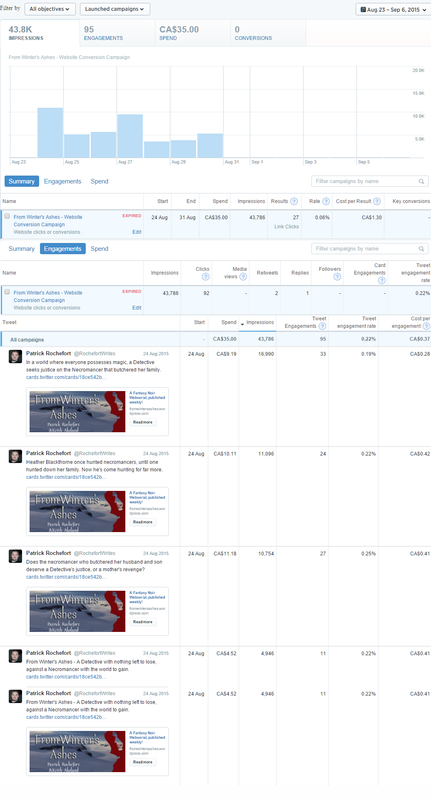 Of course you had your usual demographics analysis, but there was some spectacular other options, like: “Advertise to your followers” and “Advertise to the followers of the people you list here”, the latter option was FANTASTIC for targeting. If you know the twitter handles of, say, five or ten authors who write things like you do, targeting their followers means that you’re probably planting on fertile ground. The next thing that I liked was that Twitter encouraged you to have more than one tweet as an advertisement. If you want a great experiment in honing your pitches to 140 characters and below, this is a fantastic exercise. I created four tweets that advertised the story, and saw some very different response rates from each of them, which I’ll detail further down this article. Clicks: 27 / 92* –> 27 clicks directly through to site. Retweets, favorites, or clicking on the “WebCard” of From Winter’s Ashes resulted in upping that total to 92 interactions. Overall, $35.00 bought me 43.8k impressions, with (27/92)* clicks. Why the asterisk? 27 of those clicks were directly to the site, while the total of 92 included people who went to my Twitter, clicked on the website card, favorited, or retweeted. Twitter does some pretty good granularity that way, but they don’t always explain it well. Overall click-through rate: 0.06%. Devastatingly low. This is one-fifth the rate that Reddit offered me. On the upside, I served a lot of impressions, but overall it’s clear that on Twitter, people generally don’t want to click ads, even less so than they want to on other sites. Engagement rate: 0.22%. Not terrible, here, when we factor in people engaging with the tweet or otherwise interacting with it. As we’ve covered in prior entries, 0.2-0.4% is the average you’ll find most non-targeted advertisement fall into. The fact though that this was targeted advertisement, is another black mark on Twitter for adverts. And finally, our almighty Cost-per-click: $1.30. Pricey. I’m paying Facebook cost-per-clicks for a response rate that’s considerably lower. The impression rate is pretty awesome, which is nice for building brand awareness, but overall if people aren’t clicking, they aren’t buying. I wouldn’t use Twitter again unless my goal was new brand establishment, or to bring in a wave of new eyes and awareness on a story product. So this was a part of Twitter advertising that was really, really valuable for me. Finding out which tweet I wrote had the most engagement, and drew the most interested eyes to the story. In retrospect, it’s an obvious choice. It’s powerful, engaging, leaves the reader with a compelling question, and people clicked through a little more there than any other one. As a result, I’ve included the line in other marketing and synopsis of the story since. Twitter, at this expense level per engagement, is probably prohibitively expensive for a webserial’s conversion rates. The ability to finely target other authors followers is very nice, but is countered by the fact that Twitter users are particularly ill-inclined to engage with advertisement there. The only uses Twitter will have for a webserial’s and publishers economics may be starting up a new brand/story, getting people interested in a new book or e-book release, and generally getting your brand name out there. If so, I would recommend including your name in the tweet, so that even if the title doesn’t stick, your name hopefully does. I won’t use Twitter again for From Winter’s Ashes, I think, but if nothing else, the $35.00 spent was valuable to see, in stark statistical payout, what one-line summaries of the story were more effective at hooking people. This entry was posted in Uncategorized and tagged advertising, guest post, marketing, patrick bahumat rochefort, publishing, twitter. Bookmark the permalink.